Supporters of opposition leader Juan Guaido and the press gather around him as he leaves a public plaza where he spoke in Caracas, Venezuela, Jan. 25, 2019. Three European governments said Saturday they would recognize Venezuela's opposition leader as president if no election is called within eight days. Spanish Prime Minister Pedro Sanchez and French President Emmanuel Macron each said their countries are set to acknowledge Juan Guaido as the leader of Venezuela. German government spokeswoman Martina Fietz said on Twitter that Germany would also recognize Guaido if Venezuela fails to hold a new election. 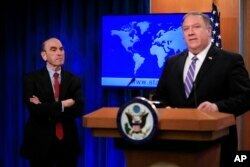 U.S. Secretary of State Mike Pompeo has appointed foreign policy veteran Elliott Abrams to be a special envoy overseeing U.S. policy on Venezuela, tasked with helping "restore democracy" to the South American nation. Pompeo made the announcement Friday afternoon in Washington, ahead of a special session of the United Nations Security Council Saturday. Pompeo said Abrams will travel with him to the meeting, which was initiated by the United States. Pompeo said the United States thinks "every country ought to recognize" National Assembly leader Guaido as Venezuela's interim leader, as the U.S. does. He called disputed President Nicolas Maduro a "cruel dictator" and said he had caused much devastation for the people of Venezuela. Pompeo said the U.S. hoped Venezuela would have free and fair elections to designate a new leader. He also vowed that U.S. diplomats in Venezuela, ordered out of the country by Maduro on Wednesday, would be protected while in Venezuela. He said the U.S. government was taking "all appropriate measures" to ensure their safety. He declined to give details on those plans. FILE - Former Chilean President Michelle Bachelet, who is now U.N. high commissioner for human rights, is pictured in Geneva, Switzerland, Sept. 3, 2018. 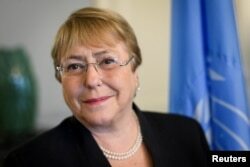 Earlier Friday, U.N. rights chief Michelle Bachelet called for talks to defuse the political tensions in Venezuela, saying that the situation "may rapidly spiral out of control with catastrophic consequences." "Any violent incident resulting in death or injury should be subject to an independent and impartial investigation to find out whether there was excessive use of force by the authorities, or if crimes have been committed by members of armed groups, whether pro-government or otherwise," she said. "More than 3 million Venezuelans have fled the country. Many millions of others are living in totally miserable conditions," she added. "This is, at heart, a crisis of governance, and it is the responsibility of the country's leaders to put an end to this disastrous situation." FILE - Venezuela's President Nicolas Maduro gestures during a ceremony to mark the opening of the judicial year at the Supreme Court of Justice in Caracas, Venezuela, Jan. 24, 2019. On Wednesday, Maduro said he was ending diplomatic relations with the United States in response to U.S. President Donald Trump's announcement that the U.S. was officially recognizing Guaido as Venezuela's interim leader after Guaido swore himself into office. 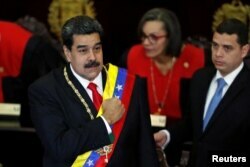 Trump bluntly warned Maduro on Thursday that "all options are on the table" if there was not a peaceful transition to democracy in the South American country. Pompeo urged members to oppose the "illegitimate'' Maduro and pledged to make $20 million available for humanitarian assistance to Venezuela. "All OAS member states must align themselves with democracy and respect for the rule of law," the top U.S. diplomat said. The department said it was ordering the evacuation for security reasons, and that U.S. citizens should "strongly consider" leaving the country. 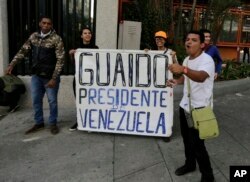 FILE - Anti-government protesters show a sign reading in Spanish "Guaido, President of Venezuela" after a rally demanding the resignation of President Nicolas Maduro in Caracas, Jan. 23, 2019. French President Emmanuel Macron called Venezuela's elections "illegitimate" in a tweet on Thursday, and saluted the bravery of Venezuelans demanding freedom. FILE - U.N. Secretary-General Antonio Guterres speaks during a meeting of the Security Council at U.N. headquarters in New York, Sept. 20, 2017. 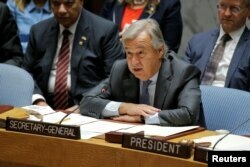 U.N. Secretary-General Antonio Guterres warned Thursday that the situation in Venezuela could descend into "disaster" if the country's main political rivals failed to reach an agreement.